Here, Darren Pyke, Managing Director at Hilsonic, offers an overview of the benefits of ultrasonic cleaning for pharmaceutical and medical clients – where cross-contamination can prove a significant issue – for safe batch production and for cost reduction. In this example, the client is an international, blue-chip, pharmaceutical company who sought a more thorough and safer alternative to manual cleaning, and turned to Hilsonic for a solution. The client had formulated a new antibiotic to be produced in tablet form, bringing together various ingredients from across the plant and using equipment also required to manufacture a range of other, standard product lines. Initially, employees had been cleaning the facility manually for batch production of the new antibiotic line. However, during new product development tests, swabs sent for analysis were failing lab testing due to cross-contamination – manual cleaning proving inadequate. Multiple testing was also showing differing levels of the active ingredient between batches. In addition to these critical production problems, whereby quality and safety were compromised, manual cleaning was also proving far too labour intensive and time-consuming. The down-time between production and batch testing was affecting not only this new product’s development but also impinging on routine production across the plant. The client was concerned, too, to avoid any potential harm to employees through long-term exposure to aggressive sterilizing cleaning agents. 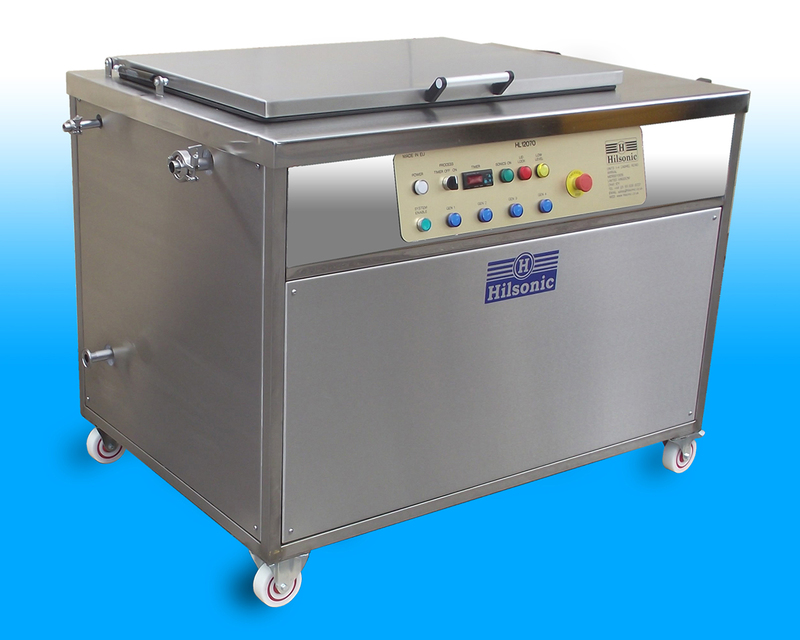 The company consulted Hilsonic, who have long been recognised as the engineer’s choice for their manufacture and supply of patented ultrasonic cleaning equipment. In comparison to manual cleaning, an ultrasonic approach offers significant improvements, with a whole range of benefits to this client, and to pharmaceutical and medical production, generally. The principle of ultrasonic cleaning involves electric transducers which are attached to the cleaning tank. These generate ultrasound waves that vibrate the cleaning fluid at a very high velocity, creating cavitation. Through this cavitation process, millions of micron-sized bubbles implode within the solution and penetrate into every orifice of the item being cleaned, thoroughly removing contaminants within seconds. Ultrasonic cleaning provides the most effective cleaning solution and an ultrasonic approach also eliminates potential damage to delicate machine parts and tooling. Especially useful with complicated or expensive parts such as those routinely involved in pharmaceutical production, the cavitation process is particularly effective on crevices, blind holes and threads, providing precision cleaning. For this client, precision cleaning meant that the potential for difference in ingredient levels between batches was much-reduced, as ultrasonic cleaning provides a thorough clean throughout the machine parts, removing all residue. A rapid cleaning cycle, which can be as short as 10 minutes, helps with batch and equipment turnaround, improving efficiency and increasing cost-effectiveness, both for general production and for product development cycles, with reduced labour costs through a quicker cleaning process that requires minimal supervision. The more thorough cleaning offered by ultrasonics can allow for a longer time between scheduled maintenance, increasing productivity and this, along with the non-abrasive nature of the process, helps reduce wear on expensive or delicate parts. The significantly shorter process – less energy consumption – has cost and environmental benefits, while the avoidance of potentially toxic cleaning chemicals also reduces the chances of further cross-contamination in the production process.